Four years ago Smart Politics sifted through the tenures of the thousands of men and women to serve as statehood governors across the nation and compiled a list of the 50 with the longest record of service. Since that post, the all-time leader in the clubhouse has resigned and three other governors moved up the list. Republican Terry Branstad ended his historic run as governor of Iowa last week, with two stints and parts of six terms totaling 22 years, 4 months, and 13 days on the job (8,169 days). Branstad has been governor for 13.1 percent of the 62,245 days since Iowa achieved statehood in December 1846 and tallied nearly five years more than South Dakota Republican Bill Janklow in second place (16 years, 7 days). [Note: George Clinton tallied 7,641 days as governor (20 years, 11 months, 2 days) from 1777-1795 and 1801-1804, but approximately half of that was before New York achieved statehood]. Rick Perry ended his governorship in tenth place at 14 years, 1 month (5,144 days) but has since been eclipsed by California Democrat Jerry Brown. Through Monday, Brown sits at #10 with 14 years, 3 months, 26 days in office (5,259 days) and is poised to finish his fourth and final term on January 9th at 16 years, 5 days (5,849 days). That will put Brown at one more day than Alabama Democrat George Wallace – the only other statehood governor to serve at least 16 full years. [Ohio Republican Jim Rhodes and North Carolina Democrat Jim Hunt fell a few days short of that mark, currently tied for fourth at 15 years, 11 months, 26 days]. Rounding out the Top 10 are Louisiana Democrat Edwin Edwards at #6 (1972-1980, 1984-1988, 1992-1996; 15 years, 10 months, 2 days), Rhode Island Anti-Federalist Arthur Fenner at #7 (1790-1805; 15 years, 5 months, 11 days), Maryland Democrat Albert Ritchie at #8 (1920-1935; 14 years, 11 months, 27 days), and New York Republican Nelson Rockefeller at #9 (1959-1973; 14 years, 11 months, 18 days). The fourth governor to make big gains on the Top 50 list over the last four years is Oregon Democrat John Kitzhaber. Kitzhaber – whose fourth nonconsecutive term was cut short in light of an ethics investigation in early 2015 – became the first governor in Oregon history to resign under a cloud of scandal. Between his two stints in office, Kitzhaber served 12 years, 1 month, 14 days (4,428 days) – good for 21st in U.S. history. With Branstad’s retirement, Idaho Governor Butch Otter now has the second longest all-time service for governors who are currently in office. Otter sits at #54 on the list with 10 years, 4 months, and 29 days on the job (3,802 days). Otter will jump all the way to #24 by the end of his term in January 2019. Republicans Susana Martinez of New Mexico and Mary Fallin of Oklahoma are also each poised to serve approximately eight years if they complete their current term ending in January 2019. Next: Will 2018 Produce Any New All-GOP Congressional Delegations? 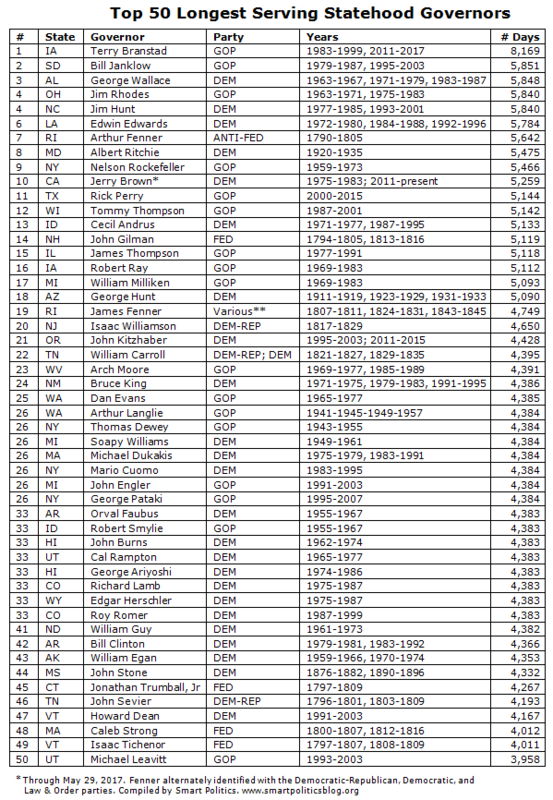 3 Comments on "The Top 50 Longest Serving Governors in US History (Updated)"
1. Had Edmund Gerald Brown Junior succeeded in his POTUS bid in 1976 -or even his ill-considered US Senate bid in ’82- he would surely, or at least likely, not have made the Top Ten Longest List, ‘grandfather clause’ or not. 2. While Kitzhaber’s fourth 4-year tenure ended before it barely began, LA D Edwards and SD R Janklow also ended their long stints with (no less) severely tarnished personal legacies, though they did complete 4 full (4 year) terms. 3. Some time this century, there will surely be a female governor who would go on to serve 3 or more (4-year) terms, and thus, make it onto the Fifty Longest Tenured List. After all, in a few days, ‘Wonder Woman’ will at long last make it on to the silver screen in live-action, standalone, and leading role! 4. Whether it is “20 years, 11 months, and 3 days” or (roughly) 22 yrs. + 4 mons., Branstad does rank ahead of New Yorker George Clinton in all-time gubernatorial tenure. While it seems much too early even to surmise who the D nominee will be, it would seem (nearly) certain that neither former 2-term Governor Tom Vilsack (also 8 full, productive years as USDA chief under BHO afterwards) nor 2014 Senate nominee Bruce Braley (“Bailey?” “Braylee?”) ends up as opponent to whomever the Rs nominate to attempt to extend their very long reign in the Tall Corn State. Yes – Branstad’s 8,169 days translates to 22 years, 4 months, 13 days. However one defines George Clinton’s 20 year, 11 month, and 2 day tenure, Branstad eclipsed him in December 2015. Clinton served 10 years, 11 months, and 26 days before New York achieved statehood in July 1788 under the newly ratified U.S. Constitution, and 9 years 11 months, and 5 days during two stints in the office thereafter from 1788 to 1795 and 1801 to 1804. 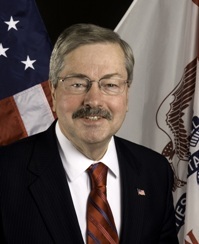 At least Branstad will be happy to be the longest-serving US State Governor with 22 years. As for Perry’s 14 years here in my beloved home state of TX, I’m predicting someone will break this record sooner or later!